With Christmas just around the corner, you’ll find everything you need to create the perfect Christmas with our Luxury Christmas Range. From rich and fruity puddings, decadent Christmas cakes and delicious mince pies, our range is packed with an array of mouth-watering treats sure to satisfy all tastes. Our beautiful hand crafted Christmas cakes are rich and moist and adorned with delicate festive decorations, and come in a variety of sizes to suit every requirement. Our Proper Christmas Pudding is made using a recipe that has been handed down through generations. This full flavoured pudding is steamed slowly to mature all the flavours of the choice fruits, which have been steeped in Irish stout and Brandy, then mixed with a rich batter. It wouldn’t be Christmas without a mince pie, they truly are a Christmas tradition. Our top quality brandy mince filling is encased in a choice of crunchy all butter shortcrust pastry and flaky puff pastry. These are delicious served hot or cold, and perfect to welcome guests this festive season. 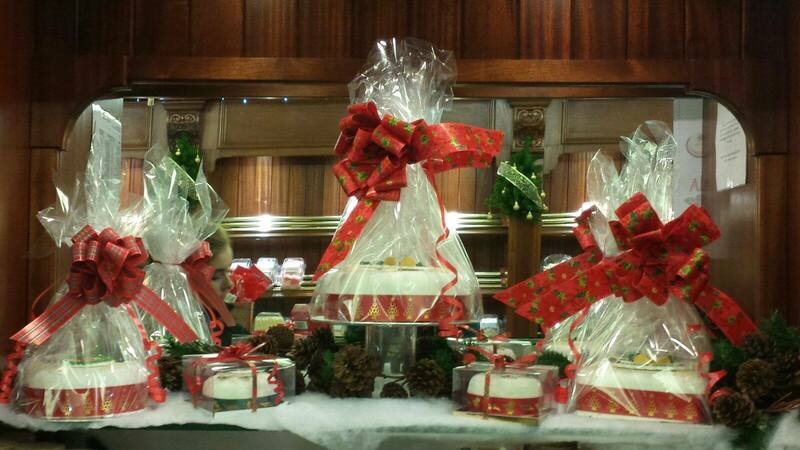 We’ve got Christmas all wrapped up with our range of festive Hampers, available to suit every budget. Treat family, friends and loved ones to one of our Luxury Christmas hampers, bursting with family favourites and some of our most delicious treats. These affordable gifts are sure to make someone’s Christmas very special indeed! Show your appreciation with our tasty stocking fillers. Choose from handmade Chocolate truffles, mini all butter shortbread and spiced cranberry shortbread, the perfect gift for teacher’s presents. So take the stress out of Christmas and choose Corn Dolly!